New York Times bestselling author Daniel Suarez imagines a chilling future where technological advances are held hostage by the government in this thriller that perfectly blends “nail-biting suspense with accessible science” (Publishers Weekly). Physicist Jon Grady and his team have discovered a device that can reflect gravity—a triumph that will revolutionize the field of physics and change the future. But instead of acclaim, Grady’s lab is locked down by a covert organization known as the Bureau of Technology Control. The bureau’s mission: suppress the truth of sudden technological progress and prevent the social upheaval it would trigger. Because the future is already here. And it’s rewards are only for a select few. When Grady refuses to join the BTC, he’s thrown into a nightmarish high-tech prison housing other doomed rebel intellects. Now, as the only hope to usher humanity out of its artificial dark age, Grady and his fellow prisoners must try to expose the secrets of an unimaginable enemy—one that wields a technological advantage half a century in the making. 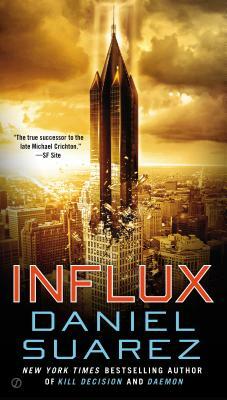 Daniel Suarez is the author of the New York Times bestseller Daemon, Freedom™, Kill Decision, and Influx. A former systems consultant to Fortune 1000 companies, his high-tech and sci-fi thrillers focus on the impact of technology-driven change. He lives in Los Angeles, California.